Content can often be an afterthought. No-one likes to be thrown a brochure and being told “Here, use this!”. Web content is specific – it requires purpose and has to fulfil objectives. Content needs to allow users to make an informed decision about you or your offering, and act on it accordingly. Getting the content you really need, is no easy feat. The process needs to be well planned, engaging and flexible. You will need to educate clients on why it’s important to have meaningful and specific content, and why it’s not ok to simply replicate content they are using elsewhere. Now, with a little education and pre-planning, the process can be less painful and quite enjoyable. Here is a quick 5 step process to getting better content from clients. Note: Every agency and project is different, this guide is aimed at giving you ideas on how to adapt and tweak your existing process to get the content you really need from your clients (and hopefully make life a little easier). Not everyone has the budget for a full-blown content strategy, but that doesn’t mean we can’t help client websites work harder and make their content smarter. Educate clients early, and reiterate the need for quality content often. Taking the time to walk through the importance of quality content, and nudging the client throughout the process will not only save you time in the long run but it also helps set expectations. When the time comes and pen hits paper (or rather fingers stroke keys), they are prepared, and are hopefully willing to put in the time and effort it requires to produce quality content (with some guidance of course). You want to avoid the age-old problem of content becoming an afterthought late in the build process. 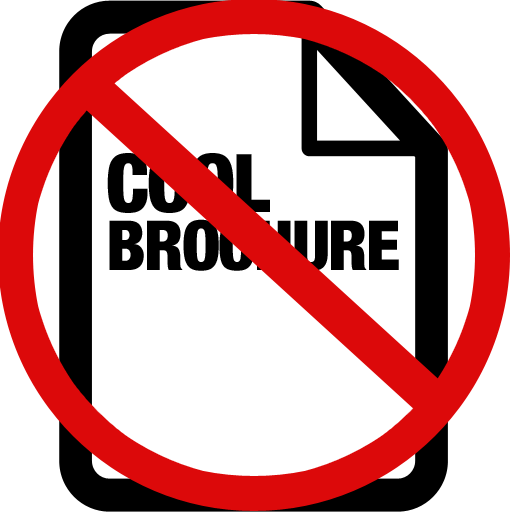 There is nothing worse than being thrown dated corporate boilerplate material, or the “cool” brochure the marketing team prepared at the beginning of the quarter. This will depend heavily on the size of the project. If you can’t get all the potential pages down early on, think about the key sections and areas of the site, and what the client needs (or wants) them to achieve. Get the client thinking about the specific content each page is going to house. Work with them, take notes together – this should be a collaborative process. What content is required to make this page compelling? For example, imagine a letting agent. What type of details do people want to see about the property before making an informed decision about their next step? Pictures, local amenities, videos, description, price, size, room numbers, a contact number etc. What can you provide which will encourage a user to act? Remember, you aren’t asking them to get writing at this stage. You are asking questions to provoke the client to spend time to really think about their business, and how they communicate via the content on their site. What do their users really need to know? Doing this now will help you and the client make realisations early on, you’ll be able to make bigger changes to your site structure without larger implications later. Working with your client and defining the purpose of a page will give a better understanding of what the page is trying to achieve, and how to shape its objectives. It will also emphasise the importance of quality content and hopefully, get the client thinking more strategically about it. 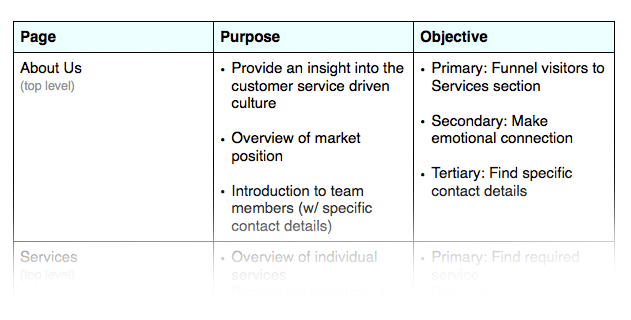 The easiest way to assign an objective is to think about the user journey and the clients business goals. You need to ensure a user is able to make an informed decision before they take their next step. If you fully understand why a page exists within the website and what it is communicating, it’s easier to take that information and derive an objective from it. For example, let’s think about a standard ‘About Us’ page. You might imagine a few pictures, history, staff bios, and an overview of what the company offers with very little call to action. Let’s turn it on it’s head, define it’s purpose and set out a couple of objectives. The purpose of the page could be to provide an insight into the customer service driven culture, an overview of the companies market position and to introduce you to the faces you will be working with. The primary objective for this page could be to encourage users to explore the company’s services further, achieved by establishing clear call-to-actions to specific services and, a secondary objective to encourage potential customers to create an emotional connection with members of the team, e.g. “Cool, Scott likes Dundee Football Club too!”. The importance here is to have actions which are measurable; whether filling out a form, making contact, placing an order, or simply moving onto a particular page. There are plenty of tools out there which make these actions easy to measure. It enables you to benchmark your objectives’ success and will provide data to test and improve on in the future. For example, how many people funneled through the ‘About Us’ page, to a particular service and made contact? What content here is key to helping a potential customer making decision? Using the analysis above, you can start to define specific content requirements. Taking your defined page purpose and the objectives, we can begin to shape the content. Think of any given website and the places, images, text, video and audio exist. The number of given styles, emphasis placed on certain content, positioning, hierarchy etc is unlimited. Getting a structure in place which gives the content team guidance, will save you a huge amount of time and ensure you are getting the specifics you really need. You need to get thinking about each individual pages specific content requirements. A great way to support the structure you are opting for, is to run this step with you analysis in hand alongside your wireframing process. Imagine you are developing the website above, you will need particular page types which dictate the content structure you require. Once you’ve determined the content needed by the page type, you can use a Word Document, or a service like ourselves to ask the client and their team to start providing you with the specific content you need. Why set up a structure? You want to give the client a framework to work within. It keeps things efficient on your side so when it comes to preparing for the site launch, you have everything you need in one organised location. On the clients side, it acts almost as a to-do list, giving them a full set of requirements to deliver on. And if there is a third party involved, like a copywriter, it will save you money as it’ll be easier for them to work through. The plans are in place, you know what you’re setting out to achieve and how you are going to do it. It’s time to get our hands on the content. Wait a minute, how are you going to get it all? It’ll depend on the project and the client. If you are working on larger projects it’s likely the information may need to be extracted from various departments. You need to assign someone who is solely responsible for the delivery of the content for the project as a whole. Sure, there may be a copywriter involved along the line to unify the language and tone, but it’s important to ensure this content team leader exists to crack the whip. The content team leader will be your sole point of contact for the approval of content and ensuring that contributors within the organisation provide the content you have set out to acquire. This also helps to minimise any crossover between you and the content team. You should work with the client to identify internal contributors to collaborate on the content. What we don’t want is content by committee, what we do want is focused people delivering on their specific area of expertise. Don’t think content gets easier when working with a smaller client, you still need to ensure quality and purposeful content is delivered on time and backs up the objectives you set for each page earlier on. It’s all about education, collaboration, organisation and review. It’s worth remembering that this process is always a close collaboration, and at no point should a client be just left to “get on with it”. You will need to review content often ensuring it follows through on your plan. There will always be different situations, stakeholders, circumstances and budgets but for what can be a relatively minimal amount of time, thinking deeply about the content can make a huge impact on the results the site you are delivering has. What about the future? We’ll discuss how to govern and manage content at launch and beyond with clients in a future post. How do you collect content? Is it a painful process? James Deer is founder of GatherContent. He previously founded a small digital agency in Scotland. He loves his daughter, son, wife, pug and snowboarding.